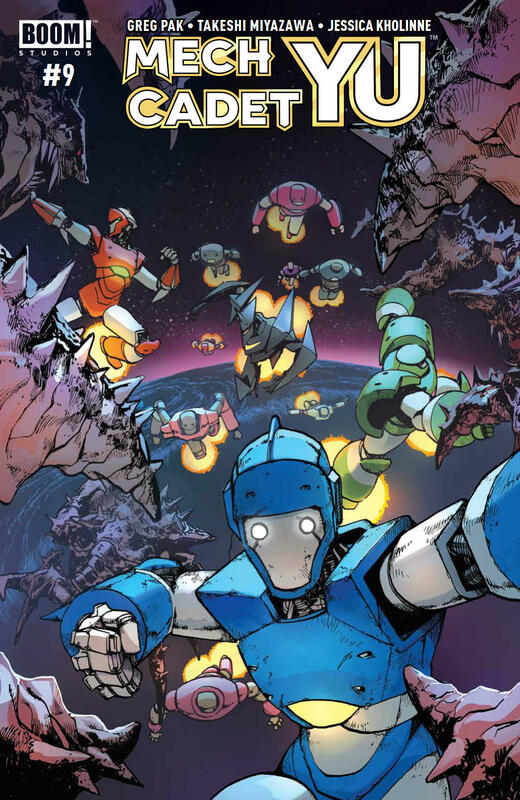 Mech Cadet Yu #9 Review – AiPT! Yu and company take on a Sharg mothership. Boom! Studios’s Mech Cadet Yu has been at the top of my pull list ever since it debuted last summer. With a lovable cast, poignant character development, and charming robot designs, the series has impressed at every turn. Now, after a two month break since the last issue, the series is back with issue #9. It’s already been announced that Mech Cadet Yu will be ending at #12, so there’s a definite sense that the creative team is building up toward their last hurrah. Does this week’s issue start the final arc effectively? Is it good? Visually, this issue is great as always. Takeshi Miyazawa has been one of my favorite comic artists ever since I first saw his work, and he continues to impress here. Most of the mechs in this issue look great, especially Skip Tanaka’s. There are a number of group shots that show, Skip’s, the cadets’, and Chief Max’s mechs flying into battle together, and they all look majestic. There’s a definite sense that the team has fully assembled and is now embarking on their most vital mission ever. The facial expressions throughout are excellent, as Miyazawa pins down exact, subtle emotions that perfectly fit the characters’ dialogue. This issue also owes a lot of its success to its coloration and lettering. Jessica Kholinne, who replaces the series’ original colorist Triona Farrell, has huge shoes to fill. Thankfully, she does so successfully. This issue’s colors are lovely, from the small shadows across characters’ faces in close-up shots to the beautiful blue and white expanses of outer space. As far as lettering goes, Simon Bowland continues to deliver clean, aesthetically pleasing work just like he did in the eight issues prior to this one. This cast’s irrepressible energy is infectious. As far as its writing goes, this issue is solid. Greg Pak’s dialogue is strong; all these characters have been well-established by now and their personalities mesh together entertainingly. There’s also a nice bit of strategy present with how the cadets plan to take down a Sharg mothership. Sanchez has the most standout moment of the issue when she calls out Park on her wishy-washy allegiances. All in all, there’s a decent amount of progress here. Unfortunately, this issue also has some faults that hinder it from reaching the series’s previous heights. Art-wise, some panels look a bit too static and lack the sense of depth present in other parts of the issue. This applies to both the line-art and coloration which, though usually lovely, occasionally looks slightly washed out. Writing-wise, I’m not fully sold on the pacing of the ending either. I also wish that we got to see more mech vs. Sharg combat in this issue. The few times we do see the Sharg, they’re rendered in less detail than earlier in the series, and as a result they’re not quite as intimidating. Overall, Mech Cadet Yu #9 is a good issue. The artwork is consistently strong, with excellent coloration and dynamic artwork. The writing is also solid, with pacing that only falters a little bit towards the end, and dialogue that sells the group dynamics the first eight issues built up. The issue’s ending is slightly jarring and the Sharg could have been more terrifying, but otherwise, I have qualms with this issue. This may not be the series’s best, but it’s still better than the majority of books on the stands. Strong art and character dynamics make this yet another fun issue.